Go to Surface Area or Volume. 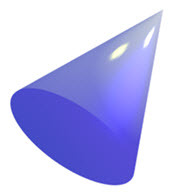 A cone can be made by rotating a triangle! The triangle is a right-angled triangle, and it gets rotated around one of its two short sides. 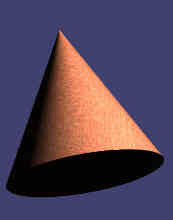 So a cone's volume is exactly one third ( 1 3 ) of a cylinder's volume. You should order your ice creams in cylinders, not cones, you get 3 times as much! A cone is also like a pyramid with an infinite number of sides, see Pyramid vs Cone. 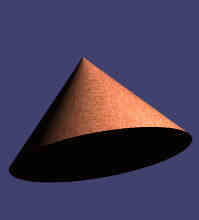 This is almost a cone, but the top is chopped off (called a "truncated cone"). Also it has a wider base added so it doesn't fall over!